Most people who have difficulty starting their car usually begin with replacing their battery. While this may be the problem on some occasions, you could be throwing away a significant amount of money. Testing your car battery is an easy way to ensure whether or not the battery is the cause of your cars sudden failure to turn over. Vehicles usually contain a starting, lighting ignition (SLI) battery which initiates a cranking, or shallow cycle that provides a surge of power to start the engine before the engine takes over and recharges the battery for its next use. However, electric cars are different. Electric car batteries require a motive, or deep cycle to provide incessant power, also known as traction power that is also used to run golf carts and forklifts. The car battery life expectancy of and SLI battery is between 4 and 5 years, and in an electric car is generally about 3 years. If you battery hasn’t lived up to its suggested lifespan, and you aren’t sure whether or not it is the reason your car is losing power, consider testing your car battery with a multimeter. A multimeter is a hand-held device that is used to check electrical circuits, voltages and provide numerical data that is commonly used to troubleshoot electrical issues. In terms of a car battery, a multimeter’s terminal is connected to the positive (red) and the negative (black) terminals of the battery. If the multimeter reads 12.4-12.6 the battery is between 75% and 100% charged. 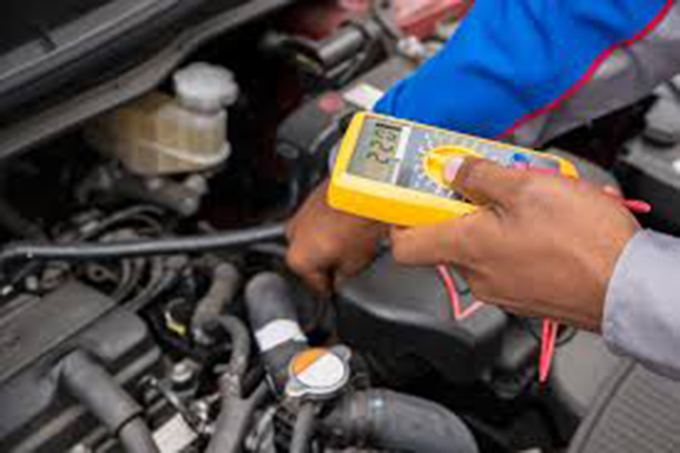 To check the battery charging voltage after jump starting the car or charging the battery, connect the multimeter the same way and you should notice a reading somewhere between 13.5 and 14.5 volts. If after testing your car battery, the voltage reading is less than 12.4 you may need to consider your options for solving the problem. If the battery is older than 5 years, purchase a new battery. However, if your battery is only slightly used, you can invest in a battery charger to bring the voltage back up to normal. A car battery charger works by converting electric voltage into stored chemical energy, which is the opposite of what a battery does. In general, the slower your battery is charged, the longer it will last. The best type of battery charger to use if you don’t need your car immediately, it a trickle charger that slowly restores your battery to full capacity. Most battery chargers come with scientifically safety designs which will prevent your battery from becoming overcharged and becoming damaged but they still need to be monitored. If your car battery wasn’t charged and you are having trouble starting your car or keeping it powered, you can follow steps to create your own refurbished car battery. Using household materials such as water, Epsom salt, and baking soda, you can create a magnesium sulfate which can be used to remove the sulfuric residue from both the terminals and the lead plates of the battery. Even cleaning just the terminals can help your vehicle get a better connection with the battery. Therefore, if you are thinking about wasting a potentially good rechargeable battery, consider testing your car battery first! This can save you hundreds of dollars over the lifespan of your vehicle.